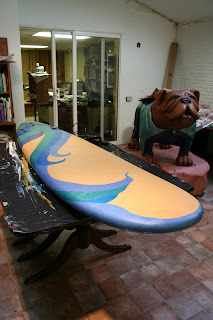 Here is a photo of the surfboard and bulldog, finished! I'll publish another when they are assembled. This was a fun project, but it's nice to be done and to get back to my own work. I hope to post a new painting soon. Wow! What a fabulous and fun sculpture! I so enjoy looking at art in a community. What a wonderful project. Thank you so much for your thoughtful and kind comments on my blog. Wow, I was wondering when you were going to show us this part. It was worth the wait! Cheers!